Three women, three generations. 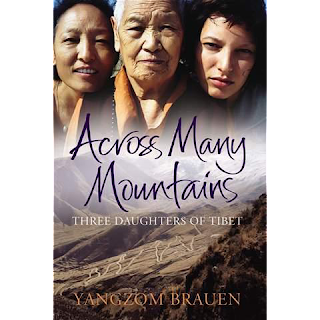 The story starts in Tibet with peaceful life, destroyed by the Chinese invasion. Dangerous escape is followed by years of exile and poverty, until a Cinderella-like twist and the arrival of Prince Charming. Gradually, scenery shifts to Switzerland and pro-Tibetan activism, ending in Hollywood in twenty first century. Unlike fairy tales, this story is true. Written by a daughter and granddaughter of Tibetan exiles (who also happens to be an actress), sharing an insider's view of the Tibetan culture. I've never been particularly interested in Buddhism. The rule of non-violence appeals to me very much but that's about it. Lucky me - if I were more smitten with this high mountain faith, I would probably read Across Many Mountains with bitter disappointment. Yangzom repeatedly explains how donations make the Buddhist prayer count. How the more you pay, the better seats in the temple you get. Ouch. Who says Buddhism is not materialistic? I always thought it's one of the most harmless religions in the world, now I have to re-think my stance. Greed corrupts creed. I loved the story, but I'd much prefer if it was told by the grandmother instead of the granddaughter. The further back in time you go, the more interesting the tale becomes. I have a funny feeling that whatever her roots, young miss Brauen is thoroughly a child of the West, with fantastic grasp of marketing and auto-promotion, and possibly a touch too much liking for forced sentimentality. It slightly spoils the picture but even so - the story of Tibet is worth knowing and preserving.